Baylie Belman got her start in gymnastics just before the age of 2 in a mommy and me class. Baylie developed a skill and love for gymnastics at a young age and began competing at the age of 5 in level 2. At the age of 6, Baylie began competing level 3 with V-Force Elite. At the 2013 NorCal South Level 3 State Championships, Baylie placed third on vault and first on bars, beam, floor, and in the all around. In 2014 at her Level 4 South State Meet, Baylie placed third on floor with a 9.550. After competing a few meets of level 5, Baylie began competing level 7 with San Mateo. At the 2016 NorCal Level 7 State Meet, Baylie placed third on beam, second on bars, second on floor, and second in the all around. She also qualified to be a member of the NorCal State Team for the 2016 Region 1 Championships. Baylie had a great meet at regionals where she scored a 9.7 on beam and a 9.575 on floor. After the 2016 Level 7 season, Baylie and her family moved to Texas and Baylie began to train at WOGA. At her first meet of the 2017 level 8 season, the WOGA Classic, Baylie placed second on vault and floor and first on bars and in the all around with a 38.275! She also scored a 38 in the all around at the City of Lights Invitational where she placed third all around. At the Texas Level 8 State Meet, Baylie finished second on beam with a 9.850 and fifth all around with a 38.425 which qualified her to regionals. Baylie had a great meet at regionals placing first on vault and third on beam, floor and the all around. Baylie had a great start to her 2018 season as a level 9 at the California Grand Invitational where she won the vault and floor titles and placed second all around. At the Texas State Championships, Baylie placed fifth all around and qualified for the Region 3 Championships. At regionals, Baylie finished third on beam and third all around, qualifying to Level 9 Westerns. Baylie closed her level 9 season at the Western Championships where she earned the silver medal on floor and placed seventh all around. 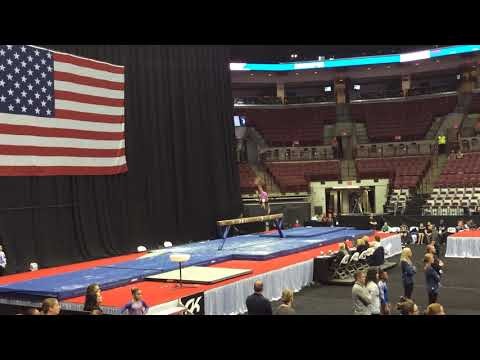 Shortly after Westerns, Baylie headed to the Netherlands to compete at the International Ascension Gymnastics Competition with her WOGA teammates. WOGA took home the team trophy. Just a week after returning from the Netherlands, Baylie traveled to Tacoma, WA to compete at the Auburn National Elite qualifier with the goal of qualifying Hopes. On the first day of competition, Baylie earned her Hopes compulsory score, and on the second day of competition, she earned her optional score. This qualified Baylie for the 2018 Hopes Classic in Salt Lake City, UT. At the Hopes Classic, Baylie had a fantastic competition, placing third on beam and floor and fifth all around, qualifying to the Hopes Championships. Baylie concluded her season at the Hopes Championships and had her best competition of the year. Here, Baylie took home silver medals on beam and in the all around - a great ending to a great season. Currently, Baylie is training for the Hopes Classic and her 2019 JO season under coaches Megan Haught, Josh Jeffries and Nataliya Marakova at WOGA Gymnastics in Plano, TX. "Work hard or go home!"